Women Who Code community group female programmer, women programmer, women developer community picture at the giant conference logo. Take a photo with the giant Google IO logo and claim some bragging rights as an Android fan Google Android geek. at the worlds largest Android Google Developer conference. Meet the Udacity team and course booth at the Google IO developer conference, android fan festival. 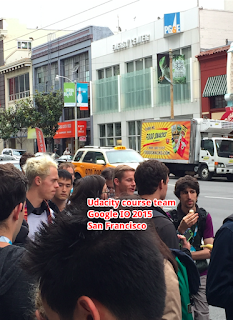 Udacity and Google has a Android nanodegree partnership. You can meet the team and get your questions answered here.